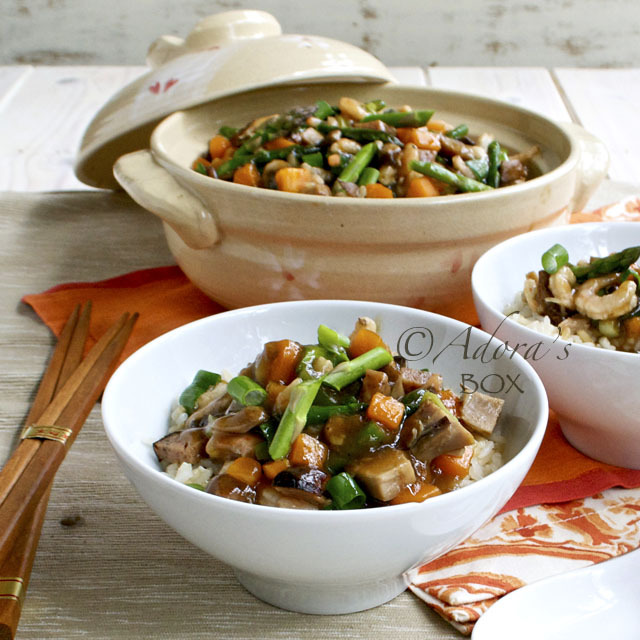 It is time to prepare for the Chinese New Year and I want to use up the leftovers from the Christmas past. Frozen peas, frozen corn, frozen ham, frozen prawns spell fried rice. 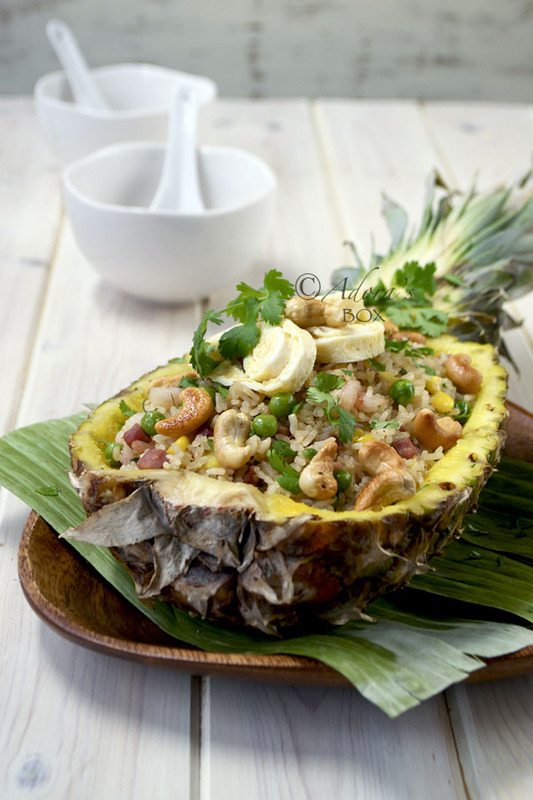 I would have made yang chow fried rice but we happened to have a pineapple so I decided to make pineapple fried rice for a change. Pineapple and ham is one of my favourite combos. I know some find it cheesy but I really do like it, especially on pizza. I can't believe the level of scorn that it receives but I do stick to my choices in life as long as it makes me happy. This dish is not Chinese nor Hawaiian despite its presentation. It is actually Thai, believe it or not. 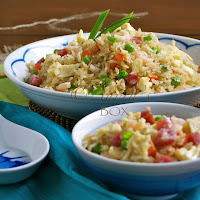 The recipe reads very much like the Chinese yang chow fried rice. What's different? There are pineapple bits in the rice. I thought it wouldn't make much difference but it does. That little touch of sweetness makes an interesting change to the rice. Although not in the recipe, I added oyster sauce, fish sauce and chopped coriander. Roasted cashews and omelette strips as toppings add texture and taste. A few minutes work would make a complete one bowl, one dish meal. It is so perfect for lazy evenings. Ditch the dining table and curl up on the sofa (use an actual bowl if you are to do this). Beat the eggs with 1/2 tsp. salt and 1/2 tsp. sesame oil. Heat up a non-stick frying pan and add 1 tbsp. of oil. Pour in half of the eggs and swirl around to coat the bottom of the pan. As the egg cooks, push the edges towards the center and let the uncooked eggs ooze towards the edge of the pan. When set, flip over onto a chopping board. Cook the rest of the eggs. Put one on top of the other, roll and cut into thin strips. Heat up a wok and add 2 tbsps. of oil. Add the garlic and fry for 3 minutes. Add the rice. Press down with a slotted spatula to separate the grains. Fry on high heat for about 5 minutes or until the rice is hot and fragrant. Transfer to a bowl and set aside. Clean the wok and heat again. Add 1 tbsp. of oil and add the ham. Stir fry for 2 minutes. Add the peas, corn and pineapple. Stir fry for another 2 minutes. Put the rice back in and season with the oyster sauce, fish sauce and chilli oil. 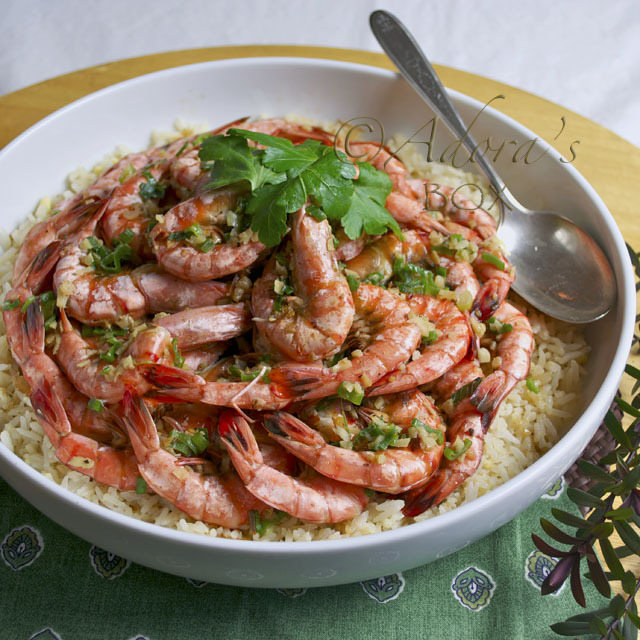 Add in the prawns and stir fry for 3 minutes or until the mixture is piping hot. 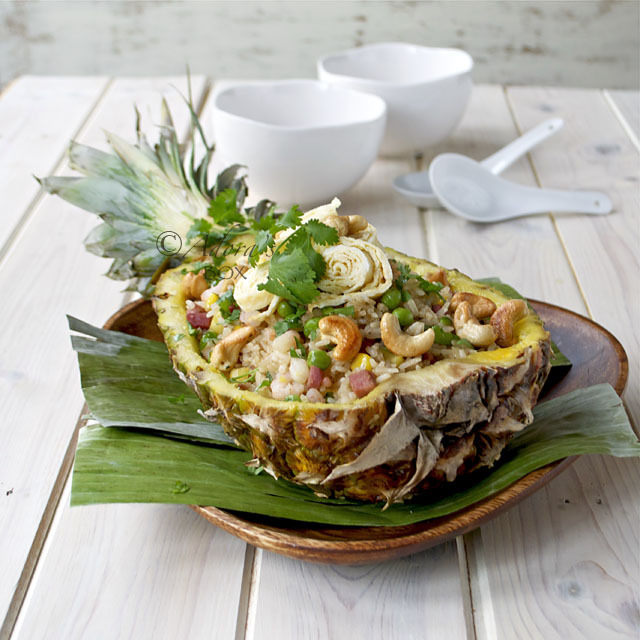 Transfer to a scooped out pineapple half or bowl and top with the omelette strips, cashew and chopped coriander. Cut a pineapple in half, lengthwise. Cut along the perimeter of each half with a paring knife, leaving a margin of 1/2" all around. Scoop out the flesh with a large spoon. Dry the hollowed shell with kitchen paper. Leave a thick wad of paper inside and set aside while you prepare the rice. Aah....this is a must have when we go to Thai Restaurant! Many many years ago my mum made this for us and she added some raisins/or currants in it. 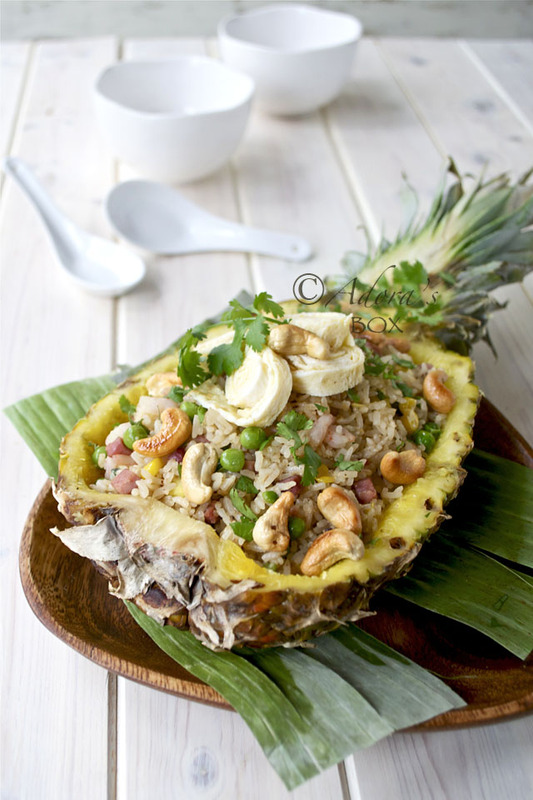 Your Thai fried rice are loads with ingredients and I love it! I am sure your family love this too. So beautifully presented. Hi Mel! I think your Mum's idea is great. Dried fruit is always good on rice. i will try that next time. Hi Adora! I love Thai food for its balance of the fundamental taste senses - Sour, sweet, salty and sometimes bitter. Besides pineapple fried rice, I like olive fried rice very much. The black salted olive really enhances the taste. Try it or google for a recipe if you have not already done so. Hi Alvin! Thai food, even simple dishes, always excites the palate. That olive fried rice sounds good. I will search for that. Hi Adora, i am new to your blog but love it :) i love the pineapple ham combo too, why would anyone not like it? :p. thai food is one of my all time favourite cuisine, we eat it very often. I agree with Avin, olive fried rice is awesome, but it can be an acquired taste. Cheers. If someone set that pineapple in front of me I would "almost" hate to eat it! But I definitely would! :) What a gorgeous presentation and I love the recipe. I had Thai fried rice with shrimp and pineapple, but never one that had ham as well. I bet the ham adds a nice saltiness to the dish. Great recipe! I agree, that is a very beautiful presentation. I like ham and pineapple too!